A recent lab build showed me that in spite Microsoft’s evangelism for Powershell scripting, every product is not yet aligned and also made me discover a nice Powershell Module about PKI management. The initial goal of my lab was to test the Active Directory Federation Services role from the Windows 2012 R2 release. As the wizard requests you to have a certificate, I genuinely told myself I can use this new New-SelfSignedCertificate introduced in the very same OS. The certificate with the specified thumbprint XXXX has a Cryptography Next Generation (CNG) private key. The certificates with the CNG private key are not supported. 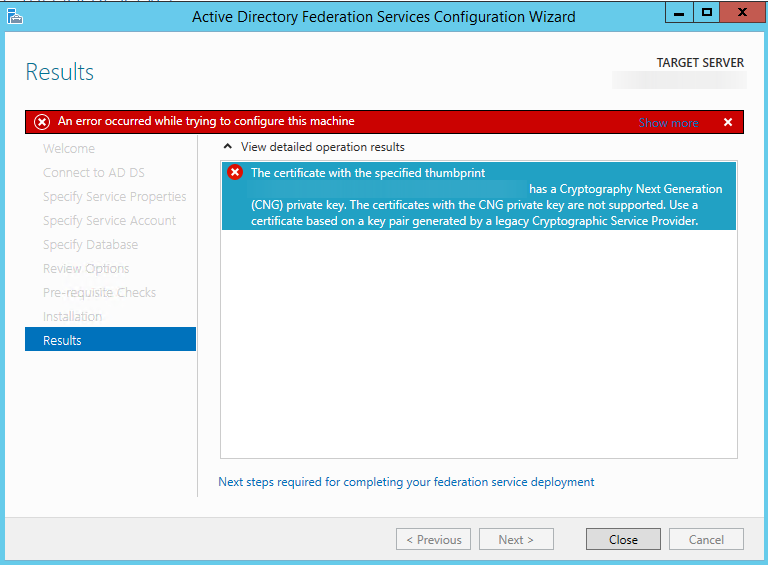 Use a certificate based on a key pair generated by a legacy Cryptographic Service Provider. Many web pages will tell you to manually craft a request from your CA, Certification Authority, and have it signed by a “simple” provider. Fortunately, there’s an easier method: just find a way to have a self signed certificate signed also with a simple provider. The Microsoft provided cmdlet however does not allow you to specify such option when called. New-SelfSignedCertificateEx -Subject 'CN=yourfederationname.yourdomain.com' -ProviderName "Microsoft Enhanced RSA and AES Cryptographic Provider" -KeyLength 2048 -FriendlyName 'OAFED SelfSigned' -SignatureAlgorithm sha256 -EKU "Server Authentication", "Client authentication" -KeyUsage "KeyEncipherment, DigitalSignature" -Exportable -StoreLocation "LocalMachine"
That was a huge help for my test environment. Thank you! !